drive that has its own operating system. Stick a new “BLU” flash drive into a USB port on your computer, and your computer will boot up with the Ubuntu (Linux) operating system. This works no matter what shape your Windows software is in. Ubuntu looks a lot like Windows and some user even prefer it. You can continue working off the Ubuntu flash drive and access all your files. You can also save those files to the flash drive or other drive or a disk. 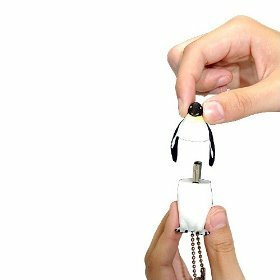 The “BLU drive” costs only $9 in the one gigabyte version and looks like a tiny emperor penguin, which has become a standard symbol for Linux systems. (The company, Active Media Products, also makes flash drives that look like polar bears and other animals.) Made of silicone rubber, it’s free of lead, mercury and other toxic stuff. Every purchase benefits the World Wildlife Fund. You can find the flash drive at Amazon.com by typing “wwf blu” into the search field. We also found it at AVCdistributor.com which had a four-gigabyte version listed for $24. If you want just plain free, you can download a version of Linux that works runs off of a CD from ubuntu.com/GetUbuntu/download It comes as an “ISO” file and you’ll need an ISO burner, like Nero 9, which has a free trial version at nero.com. There are other ISO burners at download.com.